Mark Breitkreuz served as Team Chaplain with the Bobcats hockey team from the 2007-2008 season until 2015 when he took on the role of Regional Director for Fellowship Prairies. He devoted many volunteer hours to the team’s young hockey players and hosted monthly hangouts for the team. Mark also brought his congregation out to one Bobcats game a year. Mark is pictured here receiving a team jersey from Business Manager Malcolm Radke. Mark was a valuable member of the Bobcats team, and is one of the team’s #1 fans. Read more about the new Director for Fellowship Prairies in our Regional Spotlights blog..
Emily, a mother of three and on maternity leave, never imagined she would join a church family — even when some neighbours invited her to a street Potluck & Prayer. The invitation was casual and the people seemed friendly enough. The dinner reminded Emily of her time with a L’Arche community, but that was some time ago and she was longing to be part of a community again. The people spoke a lot about Jesus and his power to change and restore their lives. Emily had heard a little about this message before, but never so clearly. Emily believed the Gospel, gave her life to Jesus and was baptized in Church of the Ward on Sunday, February 8th. She is praying for her husband to believe and do the same. There is a young, yet-to-be-saved couple at Forward City Church whose lives are being transformed by the irresistible Gospel and love of Christ. Both grew up in families broken by substance abuse and tragic deaths. Not knowing Christ they learned only to cope. However, Jesus has entered their stories and is proving the difference Christ makes. Today, both consider their friends at Forward City as their family. They believe that Jesus is the One everyone needs. They are reading their Bibles and attending a small group, curious about God's forgiveness and the love He has extended. They have not yet given their hearts to Christ, but they cannot deny Him. Their story is evidence that God pursues those far from Him, and is wonderfully compassionate. We eagerly await celebrating their salvation. We praise the Lord for Paulette who made a profession of faith earlier this year. Paulette is a direct fruit of our door-to-door ministry. We had knocked at her door in September when we were inviting our neighbours to visit “the new church” in their district. She started to attend on Wednesday evenings. She was a lovely, religious lady who wasn't sure if she had a place in heaven because she didn't know if she had been faithful enough. She had been praying that God would show her the right road to take. In presenting the Gospel, we could see the light going on in her heart and on her face as she placed her trust in Christ alone for eternal salvation. Rejoice with us. Since I am just beginning my new role as Regional Director, I will share experiences that came within the context of the church I was recently serving. I was humbled to see four friends come to the Lord. Three out of the four were friendships that developed because I was intentional about my involvement outside of the church, and in my community. It was my goal to be Christ-like, not just during our weekend services, but during the week as well. I mentioned the word, “friends.” They are. It’s been my experience that one of the greatest strategies for evangelism is to love God. We know that when we love someone, we want to be like that person and to please him. Our love for God leads others to see Christ through us. This is infinitely more attractive than them seeing us in us! The other strategy for evangelism is to love people. It goes without saying that people happen to love being loved. Three out of the four were literally years in the making. It’s why I can’t detail the specifics of the individuals, but their stories are good. It’s God through us. On our end, we need to love God and others. We pray to God to do the work of bringing people to us, so He can use us to bring them to Himself. I’ve found it’s a prayer He loves to answer. Rev. 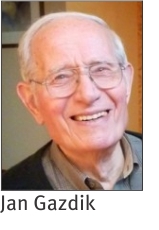 Jan Gazdik, 87, died on Friday, November 14, 2014 at Rideaucrest Home in Kingston, Ontario. He was born on December 4, 1926 in Banska Bela, Slovakia. After the war, he left for the United States where he met Alice Seatter, whom he married in 1950. Together they raised their children: Esther (Gary Bryan), Sharon (Tim Barker), Susan (John Walborn), Helen (Scott Pyne), John (Ann) and Paul (Loralyn). Jan’s love for fishing, golf and the outdoors was only surpassed by his love of people. Jan was a missionary who brought the Word of the Lord to thousands. Jan was particularly known in the province of Quebec, where he started several churches, a Christian school, and a Bible college. Jan is survived by his wife, Alice, their children, fifteen grandchildren, and eight great-grandchildren. Terry Cuthbert, who serves as the Fellowship’s Francophone Mobilizer Coordinator, shared his memories of Jan at the memorial service. “I had the privilege of working in Quebec City with ‘Monsieur Gazdik’, as we called him, for five years, between 1984 and 1989. In essence, Jan gave me my first full-time ministry position after graduating from seminary in Chicago. Our daughter, Caroline, who now lives here in Kingston, was only two months old at the time of our arrival and our son, Joel, was born in Quebec City a couple of years later. These were very challenging yet fruitful years of ministry. In order to accommodate the growth of the congregation and the Christian School, Jan led the church in two building expansions, the starting of several new churches in the area, and the opening of a Bible school in order to train our young leaders. “I would like to tell you that Jan was using such cutting-edge methodologies in order to bring about all that growth and multiplication that he should have written a book to divulge his ministry secrets, for the benefit of others — but it would have been a very thin book. Not that Jan didn’t know what he was doing, it’s just that there was nothing novel or mysterious in what he did. Jan was a conventional, hard-working, faithful man of God. At that time, Quebec City was considered the graveyard of evangelicals; however, Jan would not give up easily. He preached the Gospel to those who did not know Christ, discipled the new believers, trained young leaders and started new churches. To Jan and to all of us involved in those fruitful years, it was obvious that God was at work — and God gets all the glory for the fruit that was produced! “Jan showed up and God went above and beyond what we could ever ask or think. “Whether through preaching, teaching, discipling, evangelizing or modeling, in churches, church plants, camps, Bible schools or regional gatherings, the Gospel is more firmly planted in Quebec because of Jan’s long and faithful years of ministry among us. For this we are eternally grateful. 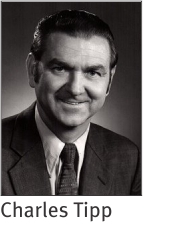 Charles (Chuck) Tipp was born on March 1, 1926 in Toronto and came to faith in Jesus Christ at the age of nine. He had a heart for God and a love of people and this was apparent in his interactions wherever he went. He married his “forever sweetheart,” Olive Erb, in 1955. He always signed his correspondence to his daughters, Carol, Cathy and Barb, by quoting Numbers 6:24-26: “The Lord bless you and keep you, the Lord make His face shine upon you and be gracious unto you. The Lord turn His face towards you and give you peace.” He loved to travel and experience different cultures. In addition to his trips to teach seminary students in India, he and Olive were able to visit Spain, Germany, and Brazil together, as well as spending time with their children and grandchildren in Nepal, British Columbia, and Australia. His life reflected great gratitude to his Saviour. He served first as a pastor at Hope Baptist in Niagara Falls and then as a professor at both Central Baptist Seminary and Tyndale Bible College. He held an M.A. and M.Div. and worked towards his doctorate, but found that his love of interaction with people outweighed his desire for another degree. He had wonderful opportunities for connection with other believers, including Inter-Varsity, Muskoka, and Pioneer camp. Chuck served with the Fellowship office as Editor of Fellowship Baptist magazine (now Thrive magazine). He was instrumental in the founding of the Fellowship’s overseas missions program, and served as both Chairman and a Board member with Fellowship International for many years, as well as with Interserve. His heart was for people to know his Saviour and connect with each other. Though it was very difficult when his eyesight started to deteriorate, as reading was a huge part of his life, he faced the loss bravely and with grace, and was always very grateful for all he had seen in the years he’d lived. His kind heart will be missed on the earth. Some information taken from the obituary published in The Toronto Star, December 12/13, 2014. During all that time, Ginette was able to look back and see how the Lord was graciously guiding her through this trial. In early 2001, He led her to read an article written by a woman who had suffered through cancer. She had trusted God to take care of her, even if it led to her death, which it subsequently did. Ginette shared how, after reading this lady’s story, she hoped that if she should experience the same thing, she would react with the same faith in her Father’s care. Four months later she learned she had breast cancer. Giny was surrounded by an army of prayer partners. She often felt physically sustained and uplifted by these prayers just before undergoing a medical procedure or receiving a chemo treatment. She would recite Psalm 23 to herself, trusting in the Shepherd of her soul to watch over her. Giny was constantly in some form of treatment from 2008 on. Yet, the Lord showed us his tender care all the time. She was treated by a compassionate team of doctors and nurses. She took part in research studies, which extended her life longer than her oncologist expected. One treatment lasted over a year, during which her energy and vitality returned (along with curly hair – a totally new experience for her!). She was able to take a long-cherished vacation to the British Isles in 2010. In 2009, the Lord enabled Giny to witness the marriage of both our sons to wonderful Christian women, and in June 2011 she held her grandchildren (a boy and a girl born just a few days apart) for the first time. She was comforted and blessed to see her children following the Lord as they established their own families and homes. "I come from a long line of sinners. Lawbreakers, liars, drinkers, adulterers, gossipers, and complainers, filled with pride, self-righteousness and selfishness. None of this is unusual but all of it is an offence to God. But I also come from a long line of sinners touched by the grace of God, redeemed by Christ, forgiven and washed white as snow. It’s a fresh start on a new path, but we soon find ourselves in trouble again. Sometimes falling, sometimes doubting, sometimes victorious and sometimes defeated. None of us change as much as we would like to but we can become ever more aware of God’s presence and of His grace in our daily lives. As we recognize our waywardness and our frailties we can acknowledge our need for help, for strength and for continued forgiveness – all this is grace. It is humbling to be a fallen creature but it is our lot in life – a position that helps us recognize God’s beauty and the splendour of his plan. I have metastic breast cancer. This is bad news. I think I will eventually die from this disease as it will spread through my body and invade vital organs. I’m in treatment so I’m buying time – my life will be prolonged, but I’m not sure how long – years probably. How many? No one knows. What should I do with the time I have? Love God and love those around me. That’s the big answer but a little more difficult in the day-to-day. Regardless of how much time I have that is still God’s will for me and that’s OK. I sometimes lose sight of this vision and get confused and distracted. I’d like to make informed decisions about plans for the future but I see that I must let go of this idea and just do the best I can with the knowledge I have today. I don’t need to be perfect and I don’t need to be a model cancer patient. This is a form of wrong-headed perfectionism. I would like to lead my life with dignity and I would like to honour God but I also want to be real. It’s ok to be sad and it’s ok to be dismayed by this turn of events in my life. That just makes me normal. And it’s ok to be normal." 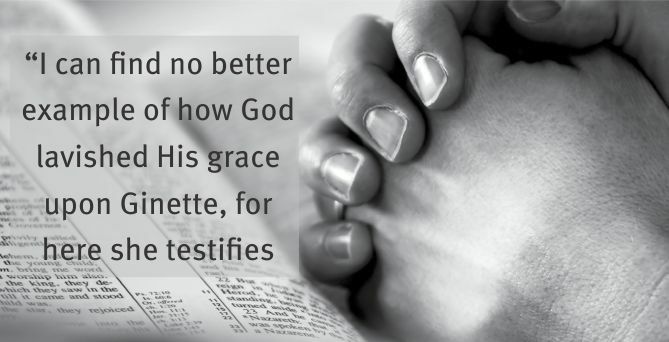 I can find no better example of how God lavished His grace upon Ginette, for here she testifies that He saved her from her sins; by His grace she understood how He wanted her to live her life for His glory; and she willingly submitted to His will. —Written by David Cotnoir (Winter 2014). The long weekend in May was traditionally our opportunity as members of the youth group from First Baptist Church, Timmins, to go to Camp Opasatica and share with our francophone counterparts from the Fellowship church in Rouyn-Noranda. This included going into town on Sunday evening to participate in a street meeting. We were terrified and excited at the same time! We had heard the stories of how Murray and Lorne Heron, missionary pioneers in northwestern Quebec, had been persecuted for preaching the Gospel. One of the older ladies in the Timmins church had been in Noranda to help out in those early days and had herself been jailed. We gathered nervously around Murray Heron as the street service began. We were waiting for the fire hoses and the pepper spray. We’d heard about them too! But this time something different was afoot. A young man edged his way to the front of the crowd. He reached out and struck one of our young men from Timmins across the face. Those of us who knew Billy held our corporate breath. We knew how short his fuse was, even as a believer. The look on his face mirrored the struggle going on in his heart. He wanted to hit back so badly. But grace won. Billy turned to the youth who had struck him and offered the young man his other cheek to strike. The boy slunk away and the witnesses stood amazed. I see the scene today as fresh as it was some 50 years ago. It was a lesson in grace under fire that I will not soon forget. The foundations of the work of the Fellowship in Quebec were laid by the faithful service of missionary pioneers, many of who suffered greatly for their consistent loyalty to the preaching of the Gospel. They demonstrated God’s grace in difficult circumstances. There are a number of short histories available that tell the story of those early days, including Footprints Across Quebec, by Murray Heron and Ginette Cotnoir, and Modern Day Missionary Miracles, by William L. Phillips.